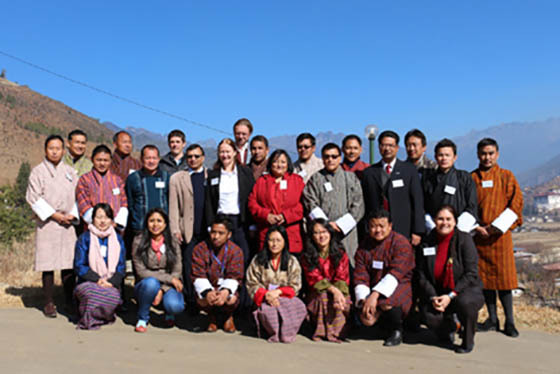 ICIMOD in collaboration with the Department of Hydro-Met Services (DHMS) of Ministry of Economic Affairs, Bhutan, organized a ‘Scoping Workshop for a Cryosphere Monitoring Programme’ in Paro from 22 to 23 January 2014. More than 27 people from different government and non-government organizations of Bhutan, Norwegian Water Resources and Energy Directorate, and ICIMOD participated in the event. The main objective of the workshop was to define the scope of cooperation between ICIMOD and DHMS for establishing a glacier mass balance monitoring programme in Bhutan and support to the Department in this regard. The workshop was organized as a part of the Cryosphere Initiative funded by the Government of Norway for expanding cryosphere monitoring programme in other regional member countries in the Hindu Kush Himalayas. During the workshop, past and ongoing cryosphere monitoring works in Bhutan and the Cryosphere Monitoring Programme at ICIMOD including the experiences of the Cryosphere Monitoring Project were deliberated along with the discussion on ideas for future work. The Bhutan Cryosphere Monitoring Programme design was planned according to the experience of previous work and ideas from the project partners. Activities like study area for long-term monitoring, responsibilities of the partners, human resource and capacity building, implementation plan, budget, monitoring system, results framework, and risk management were discussed. The major outcomes included the selection of two types (clean and debris covered) of glaciers in one basin, sharing of knowledge and experience among different research partners, and improving the in-country capacity for cryosphere monitoring through trainings and exchange study programme. It was also agreed that the ideal timeframe for an ICIMOD-DHMS Cryosphere Monitoring Programme will not be less than 5 years, and that at the later stage DHMS should take the lead role in field work, maintenance, and data management.